The Concordia Stingers football team came through with a 29-22 victory over the Sherbrooke Vert et Or, under the Concordia Stadium Friday night lights. The victory not only marks the first time the Stingers beat Sherbrooke in four years, but also the first time they’ve been 3-0 since 2006. “We’re all happy, the coaches are working hard, the kids are working hard, but it’s all about keeping it going,” said first-year head coach Mickey Donovan. 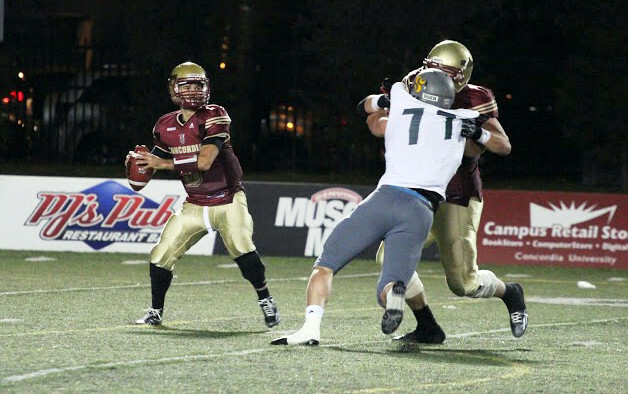 Quarterback François Dessureault, who led a strong aerial attack throughout the game throwing for 275 yards and three touchdowns, echoed his coach’s sentiments. “It’s a total team effort, everyone is doing their job, and we’re going to savor this win as a team,” he said. But it ended up being a bittersweet night for the Stingers, as early in the second quarter starting running back Gunner Tatum suffered a controversial blow to the head from Sherbrooke’s Alexandre Gagne. suffered a concussion on the play, or whether he will return for the Stingers next game. Donovan was not pleased with the fact his starting running back was knocked out of the game, but acknowledged that such incidents do happen on the gridiron. Fourth-year receiver Shayne Stinson was harsher in his assessment of the hit Gunner Tatum took. Otherwise, the cold September night in the stadium was filled with energy, backed by a mostly packed house. The Stingers struck as early as five minutes into the game, when quarterback Dessureault threw a 62-yard touchdown pass to receiver Jamal Henry, who broke a couple of tackles and scampered into the end zone. Sherbrooke added a field goal before the end of a fairly even first quarter, leaving the score 7-3 for the Stingers. After Tatum’s injury, however, momentum appeared to shift towards the Vert et Or, as Sherbrooke forced Concordia to concede a safety to cut the deficit to 7-5. Defensive back Kris Robertson just as quickly brought the momentum back for the Stingers, as he intercepted and returned Sherbrooke QB Jérémi Doyon-Roch’s pass for a 64-yard touchdown to make it 14-5 for Concordia. 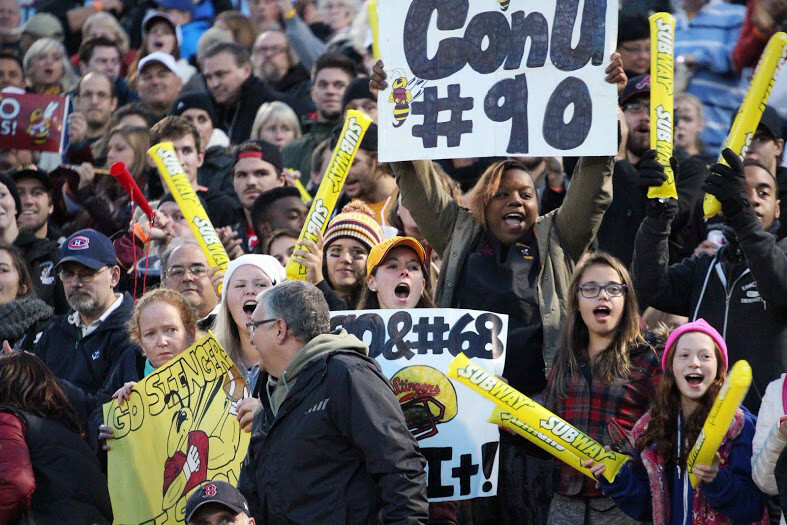 The Stingers offence then experienced its own offensive mishap when a Dessureault fumbled snap resulted in a 20-yard scoop-and-score for defensive lineman Rami Saintus to end the half 14-12 in Concordia’s favour. Sherbrooke added one last touchdown with 33 seconds left in the game, ending it at 29-22 for the Stingers. Stinson, who had six catches for 112 yards and a touchdown, said the team stepped up after coming back out after halftime. “Coaches got us real riled up at half,” said Stinson. “I took it personal and we just made it happen,” he said. Michael Asare, a second-year halfback, was satisfied with the win, but he still wants more. The Stingers will be travelling to Saint Mary’s this Saturday for their fourth game of the year. The Huskies are winless their first four games of the season, but Dessureault plans on approaching the game like any other.